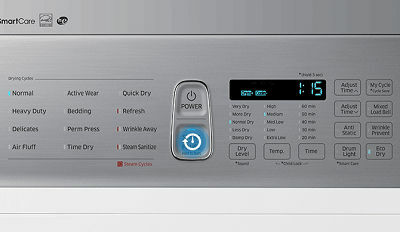 How do I dry down-filled items using my Dryer with MultiSteam, 7.4 cu.ft (DV50K8600EV)? The best way to dry down–filled items (jackets, sleeping bags, comforters, etc.) is to follow the instructions on the care label. If no drying instructions are provided, use Normal cycle and the Medium temperature setting. We also recommend to add a couple of dry towels to absorb moisture and shorten drying time. 1. Place the items and a couple of dry towels into the dryer. 3. Normal is a default setting for drying cycle. Otherwise, press Normal on the left-most panel to select that cycle.